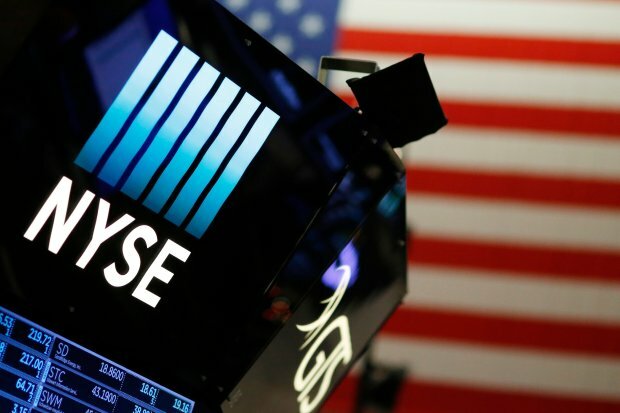 U.S. stocks have managed to grind out gains this year, despite a wild ride. That’s not true of U.S. corporate bonds, the yin to stocks’ yang. But the stuttering credit market could in time become a problem for stocks, too. 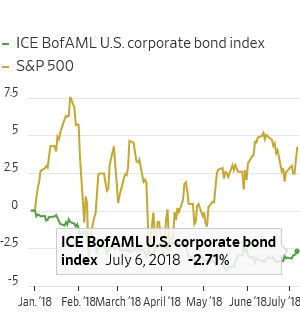 While the total return for the S&P 500 is north of 4% this year, U.S. investment-grade corporate bonds have been heading steadily in the wrong direction since February. The spread between the yield on U.S. Treasurys and that on investment-grade company debt has widened to 1.28 percentage points, from a postcrisis low of 0.9 percentage point at the start of February, ICE BofAML index data show. The index has returned minus 2.7% this year, underperforming Treasurys, down 0.9%. The move isn’t as dramatic as this year’s blowup in Italian bonds, or steep drops in emerging-market currencies. 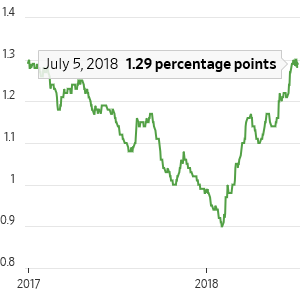 But it has shown little sign of reversing, even as more economically sensitive assets such as stocks and high-yield bonds have posted modest gains, shored up by the idea that U.S. growth is strong relative to the rest of the world. The selloff has taken the yield on corporate bonds above 4% for the first time since 2011. Company debt was previously buoyed by ultraloose monetary policy. Now the Federal Reserve is raising interest rates and starting to wind down its balance sheet. 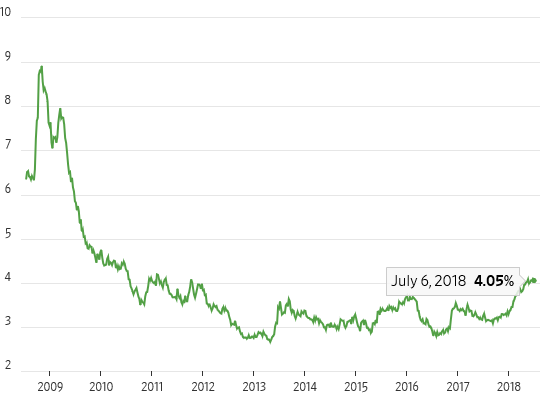 This brings companies into greater competition for dollar funding, especially with short-dated U.S. Treasury yields now at a 10-year high. Previously there was little alternative for yield-seeking investors but to buy riskier debt. And the corporate bond market is bigger and riskier than ever. The ICE BofAML index now contains more than $6 trillion of bonds, more than double the amount 10 years ago. Nearly half of it is rated triple-B, the lowest investment-grade category. Previous bouts of turmoil, such as when plunging oil prices and fears about global growth rocked markets in early 2016, lured investors into corporate bonds. Now investors seem suspicious of buying the dip. The probability that U.S. investment-grade bond returns will beat Treasurys over the next 12 months is now 47%, down from 61% a year ago, according to a survey of over 200 investors by Absolute Strategy Research. The same investors are still relatively bullish on earnings but seem to see more opportunity to benefit through stocks than bonds. The end of easy money is slowly eroding a key support for company balance sheets. This, in turn, will eat away at their earnings and risk appetite. Stock investors shouldn’t ignore the trouble brewing in corporate bond markets.